A barometer reads air pressure – basically the weight of the column of air above it. Learning how to read a barometer can really help read changes in the weather as the barometer identifies areas of high and low pressure systems. Air naturally wants to travel from areas of high pressure to areas of low pressure – just like when you let go of a balloon that you have been blowing up. Changes in the weather can be forecast by observing pressure change. Most barometers measure pressure in hectoPascals (hPa). They can sometimes also be called millibars. A hectoPascal is one hundred Pascals – a Pascal is the metric unit for pressure. In America they measure pressure in inches and millimetres of mercury. To read a barometer tap the glass firmly but lightly. This shifts any pressure change stored in the mechanical linkage to the measuring needle. The slight movement indicates whether the pressure is rising or falling. 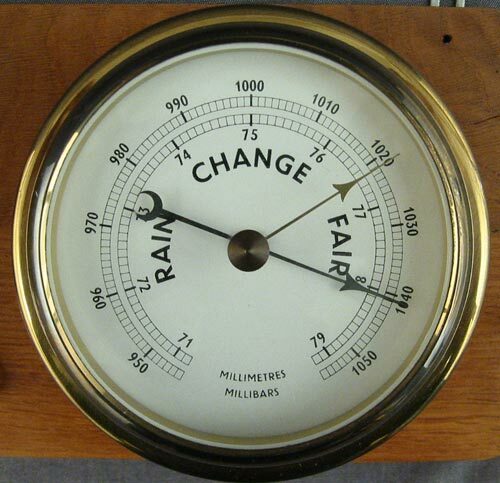 So the main purpose of a barometer is to measure not so much the actual air pressure, but the change in pressure over time. In an aneroid barometer there are normally two needles. One is the measuring hand and the other is a movable pointer which you can adjust by turning the knob on the front. You should put your pointer needle directly over the measuring hand to set the barometer. Then when you look at the barometer later you can see which direction the needle has moved. This will indicate whether the pressure is rising or falling. If the pressure changes rapidly this means that the weather system is moving quickly or becoming more intense. This can usually mean strong winds are on the way. Dropping pressure indicates more chance of rain, and rising pressure is a sign of less chance of rain. You might like to check the barometer at the same times every day and make a note of the pressure in your log. Preferably around 10am and 4pm. Before setting out on a long voyage you should adjust your barometer to read the correct MSL pressure. Simply find out the current MSL pressure and adjust your barometer to read this value with the adjustment screw. You can use the barometer to track the progress of fronts or isobars are they pass over you. Mark your target pressure on the face of your barometer and then you can monitor the closeness of the event in real time. A good rule of thumb in the trade wind belt is – do not continue to head south with falling pressure. I have just bought Andrew a Plastimo Barometer similar to this one for his birthday, so now we will be able to keep track of the weather all the time. You can read more about the Atmosphere in this blog post.